Falken Azenis RT615k+ Tire Review - Worth the Hype? When it comes to performance tires, there seems to be a lot of brand loyalty amongst enthusiasts, so let me start this out by saying I am new to the world of performance tires, so this review is coming from the perspective of someone who hasn’t experienced other extreme performance tires before. Let me also say, the tires I had on my 2015 Fiesta ST before these RT615k+ were Hankook all-season tires that the Ford dealer installed on my car before I purchased it (preowned car). With that out of the way, let’s dive right into the review. If you’ve looked at high-performance tires at some point, you probably noticed the prices seem quite high compared to standard roads tires, and for the most part, the prices are quite high. The Falken Azenis RT615K+ is one of the cheapest high-performance summer tires on the market, coming in around $100+ per tire depending on the size and if you’re buying them on sale. Compared the similar offerings such as the Bridgestone Potenza RE-71R or the Michelin Pilot Super Sport, the Falken RT615k+ is cheaper. If you’re on a budget, there is one very attractive option that has been getting a massive amount of hype lately, and that’s the Firestone Firehawk Indy 500. It’s very sticky like the RT615k+, but with a 340 treadwear instead of a 200 treadwear, plus it’s quite a bit cheaper per tire. I will likely be testing these tires in the future, so keep your eyes peeled for that. With pretty much any kind of performance tire, you are going to have a lot of road noise. Sticky tires generally have a stiff sidewall to help hold up to the lateral forces the tires must deal with while ripping through a corner. These kinds of tires use very soft rubber compounds which ultimately makes more noise when it’s rolling on the asphalt. If you’re coming from an economy tire, expect to have significantly more tire noise, more vibrations, and more harshness overall. The noise these tires is similar to that of an off-road tire but quieter. 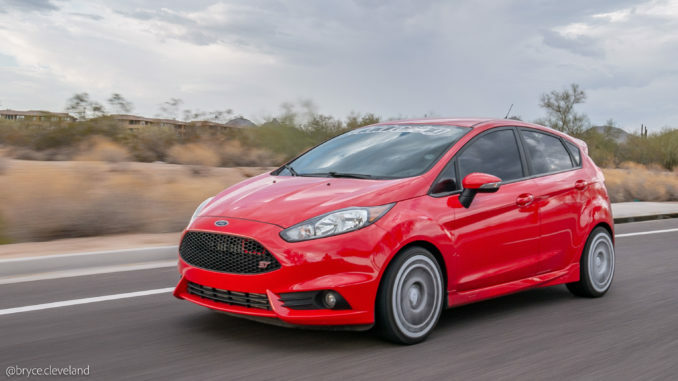 In my particular Fiesta ST, I have a very loud exhaust, so it’s difficult to hear the tires specifically, but it adds to the overall noise of driving, and if you like your car to be very quiet, then performance tires may not be the best for you. If I were to slow down to a stop light with the clutch pushed in, so the engine isn’t making much noise, you could hear the tires make a “WOOOOoooooo” noise. Again, think about the noise off-road tires make and dial it down just a touch, that’s what these tires are like. Personally, the noise and harshness don’t bother me too much, but I could understand why someone else would be annoyed by it. The whole reason someone would spend money on a high-performance tire is to experience the high grip levels on either a canyon road or race track, and after my extensive testing on my local canyon roads, I can confirm these tires are insanely grippy. As a quick test, on my previous all-season tires I did a 0-60 run which was measured by my Cobb Accessport and ran around 8 seconds which is quite terribly, but when you’re spinning through the first two gears, it’s a little tricky to be fast. I did the same test on the same road in similar conditions and ran around 6.7 seconds, which again isn’t great considering my car is modified, but that’s still a massive improvement. I will continue to do further testing and update this post as needed with the new data. As far as cornering grip, it was next to impossible to reach the limits of these tires and get my car to either understeer or oversteer. With the base ST seats, I was moving around too much to push myself much harder than I already was. During my testing, I ended up driving too hard and overheating my Fiesta ST, but the tires were completely unphased and still within operating temperatures. Braking performance, as you can imagine, is outstanding. I did have the chance to do a small amount of testing in the rain, and although these tires are decent in the rain, they are still a summer tire and don’t do well in the rain. Quite honestly, I think the grip these tires have may be overkill for street use, as using them to their full potential on the street would require driving very fast and borderline recklessly. You may be wondering what that little “+” symbol at the end of “RT615k+” means. The plus version is simply an evolution of Falken’s successful RT615k. The “+” encompasses a digitally-engineered, nanotech-formulated compound for superior grip and excellent handling. To put it simply, the + version has slightly more grip. As the guys over at speed.academy found out, there is a measurable difference on the track with the “+” version compared to the standard version. For street use, I’m not sure that extra grip will be easily exploitable, but it’s there none-the-less. To wrap this all up, let me say that I am beyond impressed with these tires. They have grip levels which I quite literally thought were not possible for a street tire. I am probably going to regret buying a tire that wears out so fast, especially considering a lot of my driving is commuting, but time will tell. Be sure to check out the YouTube video too! Great write up. Thanks for the info. I was also wondering on the fitment, specifically do these run wide? Would I have to size down to achieve a similar fitment of a normal summer tire?